Frenchtown Borough recently celebrated its 150th anniversary. The Borough was formed by an Act of the New Jersey Legislature on April 4, 1867; however the community’s history reaches much further back. 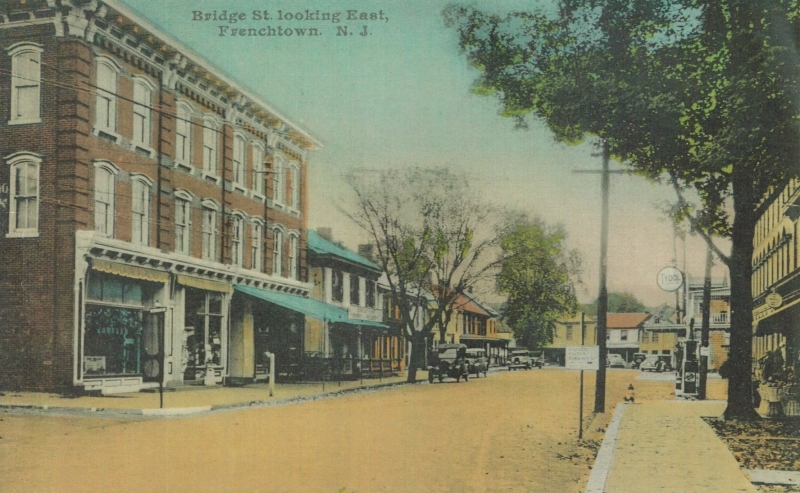 Frenchtown got its start as a Delaware River ferry crossing as early as 1741, and it grew into a hamlet called Alexandria with a store (where the Gem Building is now), a ferry landing, a half-dozen houses, and two mills powered by the Big Nickishsackawick. The Big Nickishsackawick that flows in from the north and the Little Nickishsackawick that flows in from the south, both enter the Delaware a few feet from each other. The Lenape name refers to two stream outlets near a house. The Lenni Lenape tribe populated the area until the Europeans fully took over in the 1750s. “The 968 acres that roughly correspond to what is now Frenchtown, was sold by Thomas Lowrey to Paul Henri Mallet-Prevost in 1794. Mallet-Prevost, who was Swiss, fled France to avoid a date with the guillotine. He brought along his wife, Jeanne, three sons, and several other French-speaking families. The sudden influx of monied French-speakers gave the growing settlement its current name, which became official in 1829 when the Frenchtown Post Office was established. 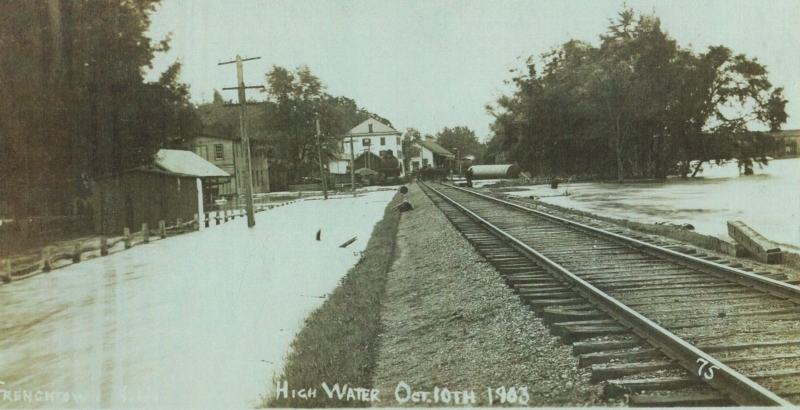 In the 1800s, Frenchtown grew as a commercial center for surrounding farmers and as a manufacturing center, shortstopping some of the hardwood that was being floated down the Delaware as huge rafts. Frenchtown sawmills were busy, and factories were turning out wagon spokes, tool handles, doors, blinds, chairs, and pianos. The Frenchtown Foundry was making plows and stoves. The town’s position was enhanced in 1844 when a covered bridge connected the town to Pennsylvania and to the nearby Delaware Canal. 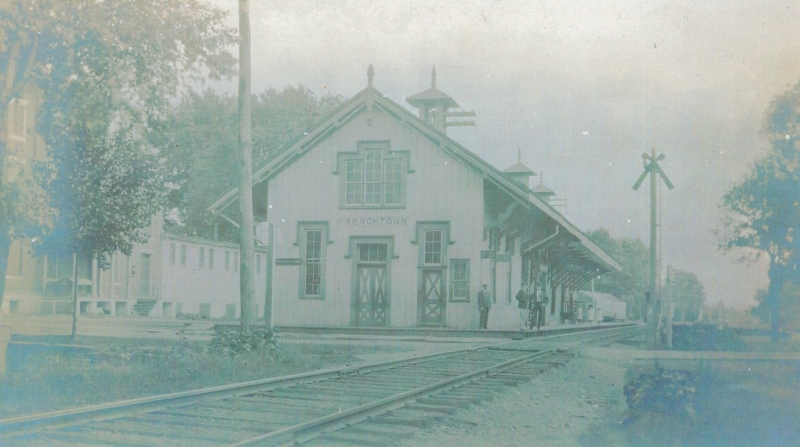 In 1853, the railroad arrived to connect Frenchtown with Trenton and Phillipsburg. 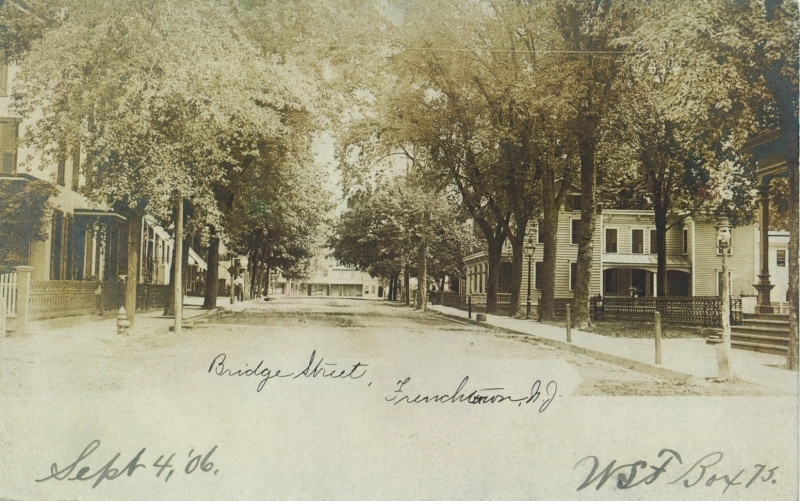 In 1867 the borough was amputated from Alexandria Township, and Borough Hall was established on Second Street, converting an 1854 structure that had been the original Frenchtown Presbyterian Church. The borough annexed some Kingwood Township acreage in 1876. 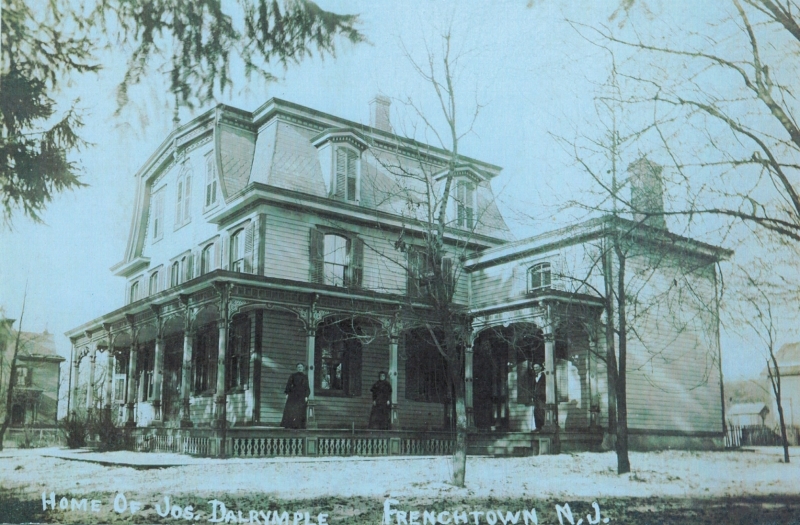 Frenchtown had three hotels – the Railroad House/Warford House (now the Frenchtown Inn), the National Hotel, and the American Hotel/Temperance House. They accommodated travelers and provided low-cost housing for more-permanent residents. The Methodist church was built in 1845; the original Presbyterian church in 1845, succeeded by the current Presbyterian church in 1854; and the former Baptist church in 1861. Aiding in the development of the town, were its newspapers – The Press (1868-78), the Hunterdon Independent (1871-1940s), and the Frenchtown Star (1879-1932) becoming the Delaware Valley News, which expired in 2008. The Great Fire of 1878 destroyed six houses and about 20 businesses, including the Temperance House; and killed two horses and two white rabbits. Raging between Bridge Street and Second Street, it was a costly setback. But it cleared the way for more substantial development, with brick replacing wood. 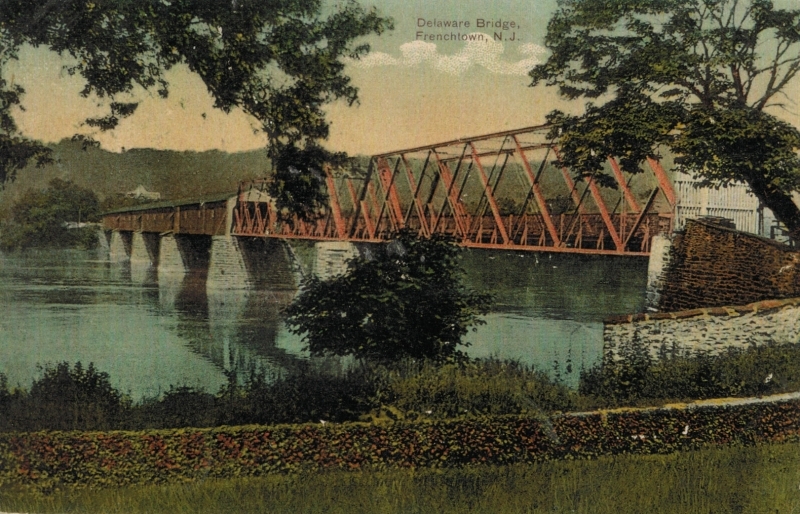 In 1903 the Delaware River rose and swept away one-third of the covered bridge, which was replaced with steel. It continued as a hybrid until 1931, when the bridge was rebuilt entirely of steel. As the upstream hardwood forests were stripped, the 20th century brought two new industries – chicken hatcheries and a porcelain factory. Soon hatcheries were producing millions of chicks, and Frenchtown Porcelain uptown was turning out faucet handles, spark-plugs and other electrical ceramics. The paper mill in nearby Milford also provided employment to many residents. An even-bigger flood occurred in 1955, inundating many properties as the river and the creeks overflowed their banks. Niece’s lumberyard, on the low ground just north of the river bridge was a casualty of that flood. Kerr Chickeries lost costly equipment, a quarter million hatching eggs, and 7,000 chicks. 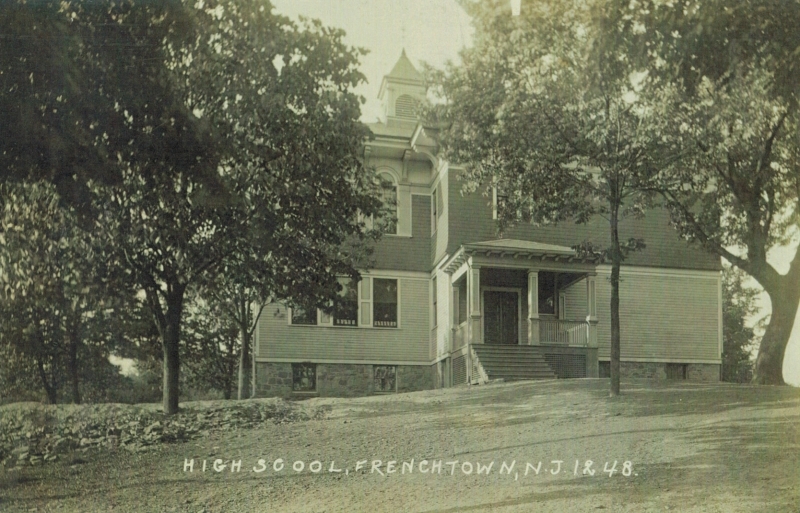 When Frenchtown High School opened in 1926, local children no longer had to commute by train to Lambertville to obtain a high school diploma. This K-12 institution also served some Pennsylvanians. But at mid-century the borough’s trajectory changed. Its industries were waning, railroad service was dwindling, the high school moved out of town in 1959, and better roads had opened shopping options elsewhere. Frenchtown went into a decline. By the late 1970s half of the storefronts were empty, and the housing stock had seen better days. New garden apartments off Trenton Avenue stood uncompleted. Then around 1980 a few antique shops opened up, followed gradually by galleries, boutiques, and enhanced restaurants. The quaint 18th-century architecture, the beauty and fun of the Delaware River and the riverside trail, and the tempting dining and shopping options, were proving irresistible to visitors. While many came just for a weekend at the local B&Bs or inns, others put down roots in Frenchtown and the surrounding area. Property values rose, and many houses and commercial buildings were restored or rebuilt. The Frenchtown Business & Professional Association’s Bastille Day celebration, and later its Riverfest, augmented the traditional Memorial Day and Halloween parades. 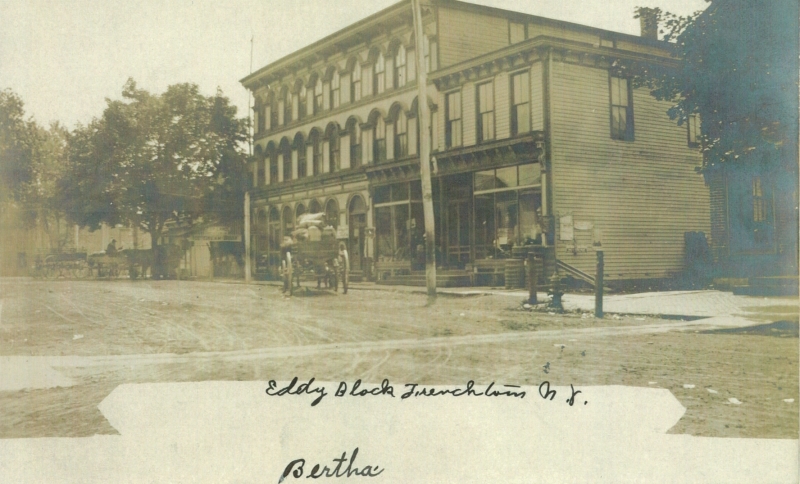 Frenchtown had become a destination. 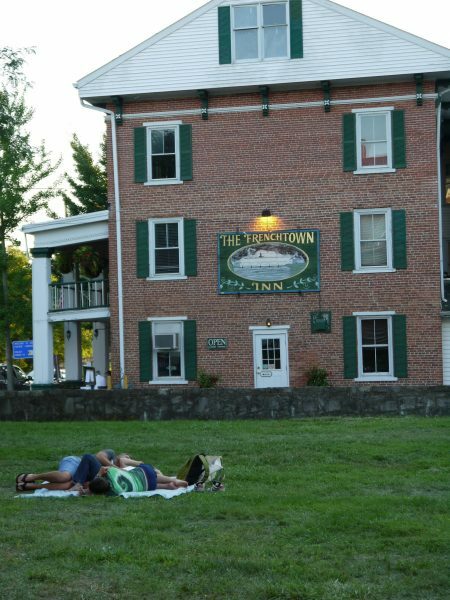 The beauty of Frenchtown and the surrounding Delaware Valley is a ceaseless draw for artists, writers and musicians. Writers of note who have called Frenchtown home include James Agee (1909-1955), Nathanael West (1903-1940), and Elizabeth Gilbert (1965- ). Frenchtown’s artistic appeal was most recently felt by the Sprocket Foundation, which has established the ArtYard gallery and theater on Trenton Ave, and an arts residency program in a neighboring cottage. It has plans to transform the chicken hatchery on Lott Street into a more-permanent theater and gallery space. These unfolding enterprises continue to add strength and variety to Frenchtown’s already exceptional cultural appeal, natural beauty and commercial viability. This look backward was prepared by Rick Epstein, a student of local history. He came to Frenchtown in 1977 and was editor of the Delaware Valley News from then until 1984. An historical artifact himself, he conducts tours of downtown Frenchtown and is currently haunting the Frenchtown Cemetery, preparing another tour. He can be reached at RickEpstein@yahoo.com. Thank you to David Miller for providing these wonderful photos.